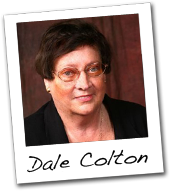 Dale Colton has over twenty-five years experience working in Public Relations, Promotion and Publishing with individuals, centers and organizations that make up the global grassroots spiritual/socially conscious community. She holds a Masters Degree in Education in Counseling. She coordinates and conducts “Celebrate Change” programs – as part of an International community outreach movement that encourages change through personal and social transformation. She also serves as a Promotion and Publishing consultant to Deepak Chopra and others. Dedicated to creating change thru the expansion of consciousness she believes we have the power, through choice to embrace any reality we want – war, aggression and self-destruction or peace, compassion and awareness. We have windows of opportunity constantly being presented to us within which quantum leaps can be made. Mutual respect, cooperation and collaboration among communities and organizations of like-minded people world-wide can collectively create enough conscious coherence to form a “critical mass” to shift the consciousness of the planet and achieve positive change.